When Pauline Frommer ’88 visited Guatemala with her family recently, she didn’t have to eat dinner for $4 or stay in $30–per–night hotels. Traveling with her husband, physical therapist Mahlon Stewart, and their two young daughters, she could have rented a car instead of taking $5 shuttle buses. She could have hired a private guide, rather than juggling maps and guidebooks while navigating the new country on her own. You also get great experiences. In Guatemala, her family roasted marshmallows over hot lava from a volcano—an inexpensive treat that many luxury travelers would crave. While it may be hard to spend a lot of money in Guatemala, Frommer says budget travel is equally rewarding in an expensive country such as Germany. But that’s not the dominant message Americans get when they scan travel magazines for tips and information. Luxury travel tends to get the most attention. In part, that’s a natural consequence of advertising, which drives coverage in travel magazines. A controversial aspect of travel writing, moreover, is that many of its practitioners could not do it without direct subsidies from hotels and other providers of travel services, according to Laura Daily, a freelance travel writer and past president of the Society of American Travel Writers. Because many newspaper travel sections are shrinking and often pay freelancers paltry rates, Daily says it’s almost impossible to write about worldwide travel without some subsidy. And the Internet—where about 90 million Americans get travel information each year—adds a related problem. Whom do you trust? While travelers can always turn online to reputable publications such as the Wall Street Journal, USA Today, the Los Angeles Times, and the Washington Post, the Web is rife with other sources of information that offer readers varying degrees of journalistic integrity. But Frommer, who doesn’t accept freebies, is trying to break through the din with travel writing of high journalistic quality that will steer people off the luxury–dominated path. With plans to push her message of budget travel for all, she is working on cell phone applications, syndicated newspaper articles, and even a television show. The hard work paid off. In 1995, Arthur Frommer gave his daughter co–author credit on New World of Travel, in which she contributed stories about yoga vacations and visiting utopian communities. Although she was still acting professionally, she soon realized she preferred writing and editing to auditioning and performing. Though she’d traveled since before she could walk or talk, she was still a novice travel writer when she became editor of Frommers.com, a site she helped to create. Despite her inexperience, she was in the company of peers online, all of whom were discovering how to translate from print to the new Web medium. Finding her travel–writing niche was simple—and a choice she attributes to her time at socially–conscious Wesleyan. 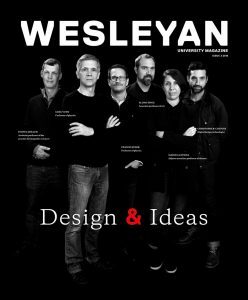 Because of Wesleyan, “I see all the shades of gray,” says Frommer, who studied intellectual history. “It very much shaped my approach to the travel industry.” In her view, how we spend money boils down to an ethical choice. “So much of travel writing is about luxury travel and, quite frankly, wasting huge amounts of money to please yourself,” she says. “I find it unseemly and disturbing.” Travel should be inclusive, she argues, rather than reserved for society’s most affluent. Leaving the backpacker set to other budget guidebook authors, Frommer aimed her book series at families and people older than 25. The books, called the Pauline Frommer Guides (14 books are in the series, from New York to Italy to Costa Rica), are for average American travelers who want to travel cheaply, yet want options beyond hostels. “That’s the niche I’ve been trying to fill in the marketplace,” she says. She has lived countless budget travel adventures, from testing street foods in Asia, to renting rooms in locals’ apartments in Italy, to auditing card dealers classes and attending “karaoke” nights in Las Vegas. In addition to her guidebooks, she hosts a nationally syndicated radio show on travel and maintains a strong travel–writing presence in other online publications. Primarily focusing on her niche, budget travel, she writes regular online columns for Weight Watchers and Bing Travel, while still contributing to the Frommer’s web site. Along with her ongoing work, she has launched a campaign to extend the Frommer brand—from developing an iPhone application to creating a travel news service with her father. Frommer travel content is popping up online, including the New York Times web site. “We’re making all kinds of strategic partnerships,” she says. In May, the Frommers started a kind of wire service for travel. They’ll supply the travel articles and columns, and newspapers will provide the outlet. Their first clients are Canada’s Toronto Star and The Palm Beach Post. And, in a move that would bring her career trajectory full circle, she is working to launch her own travel television show. It wouldn’t be her first time in the limelight since her acting days. For five years, she was a weekly presence on CNN’s Headline News until the channel shifted its focus to political news. As she envisions it, her show would be magazine–style with three segments each week on differing aspects of travel and the industry. An episode might begin with a look at “poorism,” travel to observe people living in poverty, and the ethical issues associated with touring struggling communities, such as South Central Los Angeles. The more light–hearted home–cooking movement in Italy, in which travelers are welcomed into Italian homes for meals, could be the focus of the next segment. The show might wrap up with a piece on tips to save money on airfare. Christina Hernandez is a freelance writer in the Philadelphia area who contributes to the Philadelphia Inquirer, Latina, and other publications.